AS MUCH PROGRESS as they have made, self-driving cars still have many challenges to face involving safety and reliability. One of the major challenges for such vehicles is being able to navigate adverse weather conditions like rain and snow. It’s something the likes of Google and Ford are trying to solve, creating different ways to dealing with such conditions. Such cars use a combination of on-mapping service as well as cameras and sensors like LiDAR (a sensor that uses light from a laser to measure distances) to help navigate roads. 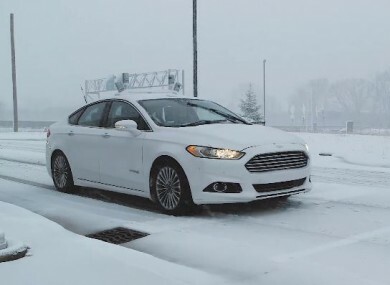 Snow and rain make it harder for a car to do this accurately so in Ford’s case, it’s using LiDAR to pick out major landmarks within the vicinity of the car. To help with this, it has its own high-resolution 3D maps that include details like pavements, line lanes, signs and other objects which it uses to help determine its position. By using this data, it can tell where it is on the road even if the snow or rain reduces visibility and make the necessary adjustments. The drawback is these cars would only be able to do this on roads it has already mapped, a process that will take time to complete. Recently, Google released its latest report on its self-driving car project, having covered more than 2.2 million kilometres in autonomous mode. It also started testing its cars in rainy and snowy conditions to help improve its capabilities, and gave its sensors mini-windscreen wipers to ensure its view isn’t blocked. “As we’re developing the technology, we’ve made sure our cars are aware of how rain may affect their ability to drive,” said its report. Our cars can determine the severity of the rain, and just like human drivers they drive more cautiously in wet conditions when roads are slippery and visibility is poor. For now, if it’s particularly stormy, our cars automatically pull over and wait until conditions improve. While autonomous cars are still under works, many other car manufacturers like Audi and Tesla Motors are working on their own hybrid-style vehicles. Tesla Motors, the company owned by Elon Musk, introduced an autopilot mode for its electric cars, the Model S and Model X. When the car is on the road, it can automatically steer, change lanes and adjust its speed in response to traffic. While the plan is to gradually introduce new features, drivers are still required to keep their hands on the steering wheel to cope with any unforeseen changes. Email “This is how self-driving cars are learning to deal with bad conditions”. Feedback on “This is how self-driving cars are learning to deal with bad conditions”.